Hey, my friends! How has January been treating you so far? I gotta say – it hasn’t been too bad ’round here. The weather hasn’t been ‘summertime level nice’, but decent for this time of year. And I’ve been cooking up a storm with all sorts of nutritious comfort food recipes, like this chicken and rice skillet. You know what I love about this recipe besides the awesome flavour? It’s SO easy to prepare! You just put all the ingredients in one pot and way to go! There’s not a kitchen full of dishes required and very minimal clean up. I don’t know about you, but I need more recipes like that in my life. To be honest, though, no matter what I do in the kitchen, I somehow always make a mess…..hubby can attest to that. What are the Benefits of Rice? Are you a fan of rice like me? It’s eaten in our home on the regular. It’s so inexpensive (like, I bought a huge four pound bag of whole grain brown rice for less than $7!). I’m pretty sure I can feed the entire street for a week on it, lol. Plus, it’s a delicious base for so many recipes like stir fry, veggie and rice bowls and, of course, this healthy southwest chicken and rice skillet. Trying to keep any healthy eating new year’s resolutions on track? Well, this recipe is for you!! And one thing about me, is that I will never sacrifice flavour. I’ve been there in my younger days, eating boring ‘diet’ foods. These days in my more experienced, (or, er) older wisdom, I’m all about real food. This chicken and rice skillet hits all the important check marks for me. If you can’t finish this whole pan in one sitting (because there’s only two people in your household like mine), leftovers warm up beautifully. If you want to bring a little more ‘life’ to the dish upon reheating, just add a touch of chicken stock to the mix as you reheat. And, if you are thinking beyond dinner, leftovers are delicious for breakfast with a poached egg on top…..just sayin’. Hope you love this easy chicken and rice recipe! 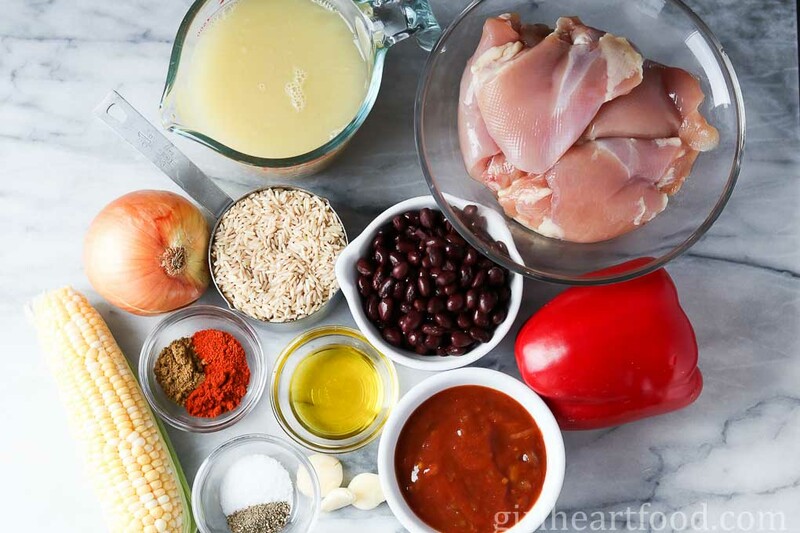 This one pot Healthy Southwest Chicken and Rice Skillet is sure to be a family favourite! It's loaded with flavour from spices like cumin, cayenne and smoked paprika and packs a filling punch of nutrition from whole grain brown rice and chicken thighs. Garnish to your heart's content! This is one delicious recipe! In a 10 inch skillet on medium heat olive oil. Add onion and cook until translucent, about 5 minutes. Add garlic and cook an additional minute. Add chicken, salt, pepper, cumin, smoked paprika, and cayenne. Stir for a minute. Add rice, salsa, black beans , bell pepper, and corn. Stir to combine. Add butter (if using) and stir. Add chicken stock and stir to combine. Bring stock up to a light simmer and cook, covered, about 40 minutes. You may way to stir part way through to ensure it's not sticking. Also, ensure that the simmer is not too rapid so it doesn't burn. When liquid is absorbed and rice is cooked, turn off heat and let sit, still covered, for 10 minutes. Remove cover and stir. Portion and garnish as desired. Enjoy! I used whole grain brown rice (not precooked). When cutting the chicken, you want about 4-5 chunks per thigh. I left it on the larger size so it can withstand the cooking time. Chicken thighs can withstand longer cooking times than chicken breasts too. I used unsalted stock in this recipe. If you use salted, please adjust your salt accordingly to taste. Keep in mind that the spicier the salsa you use, the spicier this recipe will be. If you are using a spicy salsa, you may want to omit the cayenne. When cooking this dish, it is important that it's on a light simmer. You want the rice to cook and liquid to absorb, but you don't want to burn the rice. I think I’d love this… especially with that avocado on top! I’m sure you would 😉 Thank you so much Natasha! This is an exceptional lunch recipe which my family will love, Dawn! I love the combination of nutrient-dense ingredients which make this dish finger-licking! This one pot meal sounds like my plan of a weeknight dinner. Thanks for such a wonderful and easy recipe. I love southwest flavors. Gonna give this one a try! Yay! Hope you enjoy it, Neha! One pot meals are the way to go! This recipe sounds great- I need to switch up my weekday routine so as to not have too much pasta. Plus, everything is better when those toppings are included! They sure are 😉 Gotta love the garnish! Thanks Shauna!! I love easy meals like this! Especially when they’re filled with southwest flavors, one of my favorites! I could easily make a meal out of this for breakfast, lunch, or dinner. Such a delicious dish! Pinned! Happy Monday to you! I was just saying to Keith that we need more go-to weeknight meal that can be made in one pot and this fits the bill perfectly – so many flavors that we both love! Thank you, my friend! I love a good southwest dinner and this looks perfect for weeknight dinner. yum! These types of recipes are my absolute favorite! I love southwest flavors, I love healthy, and I love easy to prepare! Meaning, I straight up LOVE this recipe and I can’t wait to try it! Pinning! Yum yum yum! I love one-pot meals and this sounds so so delish! I can see adding this to our weekly meal planning lineup! Love that this is a one pan meal Dawn! My husband can also attest to the huge mess I make in the kitchen, so one pot meals are a win in our house! I also love that this dish is both hearty and healthy! A perfect winter meal! Happy weekend! This is totally my kind of meal, Dawn!! I love skillet meals, I love rice, I love chicken, I love southwest spices….seriously, there is nothing NOT to love in here!! Can’t wait to try it and let you know how we love it!! I hope you have a great weekend!! This NEEDS to be added to my weekly meal plan. Loving it!! It does, it does! Thank you Sues! I can really get into this dish! It has great flavor, fortifying, easy to make, and looks DELICIOUS! And it’s chicken and rice, which I’m always in a mood for! Woo hoo! Thanks Thao! It really is quite tasty 🙂 Hope you get a chance to try it out! This is the perfect weeknight meal for my family. Every ingredient in this is something my daughter would actually eat…which is a small miracle!! YUMMMM! Thank you for the great recipe. This is my favorite kind of dinner–easy, but delicious and nutritious. And comforting too! All those spices make me smile :). I’m glad your weather is a little better; berry season will be here before we know it and I can’t wait! Have a great weekend, Dawn! Thank goodness you’ve posted a healthy recipe today Dawn, since mine was a little on the not so healthy side! This looks like something Tom and I would both enjoy too! Pinning. Happy weekend! Haha! Thank you Mary Ann! Hope you get a chance to try it out soon 🙂 Happy weekend to you too!